School children have been repeatedly targeted by a group of men driving a white van, it has been claimed. 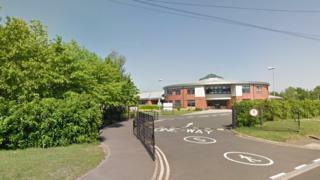 Two pupils from Gosforth Central Middle School in Newcastle were approached on Wednesday, the school said. One of three men in a small white van parked on Park Avenue, Gosforth asked pupils to get in. It was also claimed that later the same day men in a white van tried to grab a Year 11 girl who attends nearby Gosforth Academy. Gosforth Junior Academy director Denise Waugh said in a message to parents that "the same men may have been in the Park Avenue area" on Thursday morning in a silver van. Northumbria Police said it had "identified the vehicle in question and those believed to be involved". "Enquiries are ongoing to establish if any criminal offences have taken place but officers believe that both reports relate to the same vehicle," a spokesperson said. "Extra patrols will be in the area to offer reassurance to children and their parents." Newburn Manor Primary School said similar incidents had happened near its site over the previous five days. Head teacher Stuart Pickup said in a letter to parents that two men in a white van had approached a number of pupils "asking for information or inviting them into their vehicle".